My second encounter with New Hampshire was rather brief. I entered the granite state in the early evening and headed straight to North Conway in the White Mountains to find a cheap motel. Conway is a bizarre sort of place, something of a cross between a resort village and a suburban shopping mall. Only in America. Anyway, I just needed some place to sleep and eat, and for that Conway was a perfect choice. After booking myself into a typical no-frills motel I went in search of something to eat. Luckily I didn’t have to search too far as after just a few minutes walk I came across Hillbilly’s Southern BBQ. Yes, an authentic southern BBQ right bang in the middle of New England. Here I have to mention that I absolutely love American style BBQ. In my opinion it is the best contribution of America to the culinary world. So you can imagine my joy when I discovered this little gem. It was Monday night so the place was practically deserted with only two or three customers by the bar. You must know that in many establishments in America you can order food to be eaten at the bar where you have good contact with the bar staff and fellow customers. Great idea if you ask me. It is especially handy when you travel alone as you can easily strike up a conversation. The food (pulled pork with all the sides) was great, the beer was cold and people (including owner, chef and waiting staff) were friendly. I had a really good evening. The following day started with an equally tasty breakfast in another lovely local restaurant. 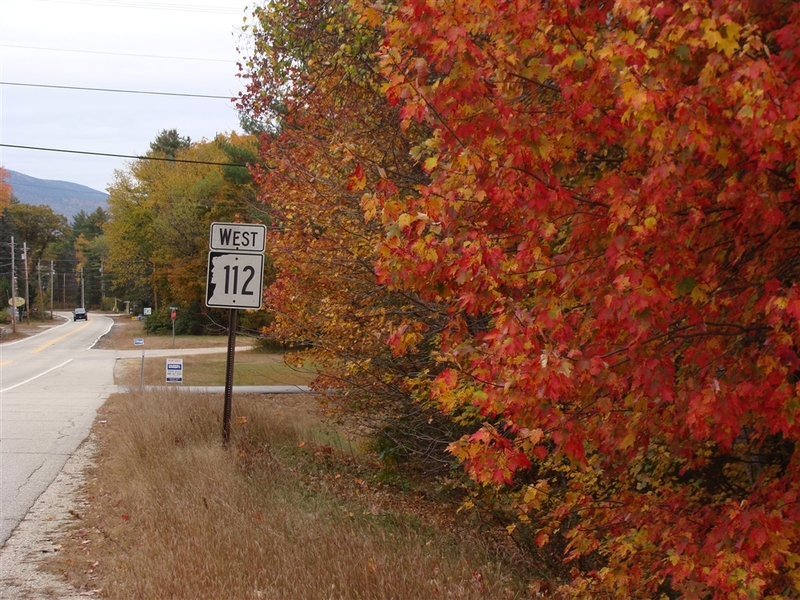 I had great plans for that day, namely to drive the impossible to pronounce Kancamagus Highway (part of New Hampshire Route 112). 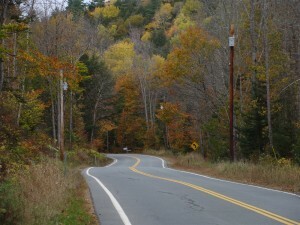 This scenic windy road runs west across the White Mountains and offers great views especially in the peak autumn foliage season. The colours were definitely there but so was absolutely miserable weather. The deeper I drove into the mountains the heavier the constant drizzle and mist got. Don’t get me wrong, it was still a splendid drive, with all the rain and mist adding a magical atmosphere to the landscape, but it wasn’t conducive to longer exploration. So after a short drive with just a few photo stops I sped towards another state, Vermont. 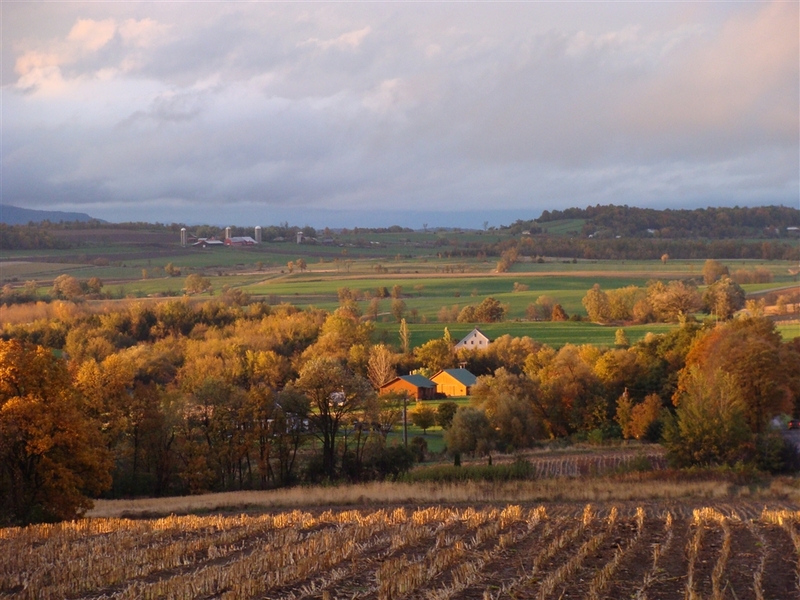 According to guidebooks and popular opinion Vermont is different. More hippy, eco-friendly, alternative etc. Practically a slice of Sweden sandwiched between the US and Canada. Is that true? Well, maybe, but I didn’t notice. What I did notice was beautiful scenery and the slow pace of life. The weather did improve a bit and I quickly made it to the town of Barre. There I encountered one of the weirdest sights I have ever seen in America. Located on the northern outskirts of the town is the amazing Hope Cemetery. It was established in 1895, and then consisted of 53 acres. Also by 1895, skilled artisans from around the world, especially Italy, had been flocking to Barre to become a part of the booming granite industry. 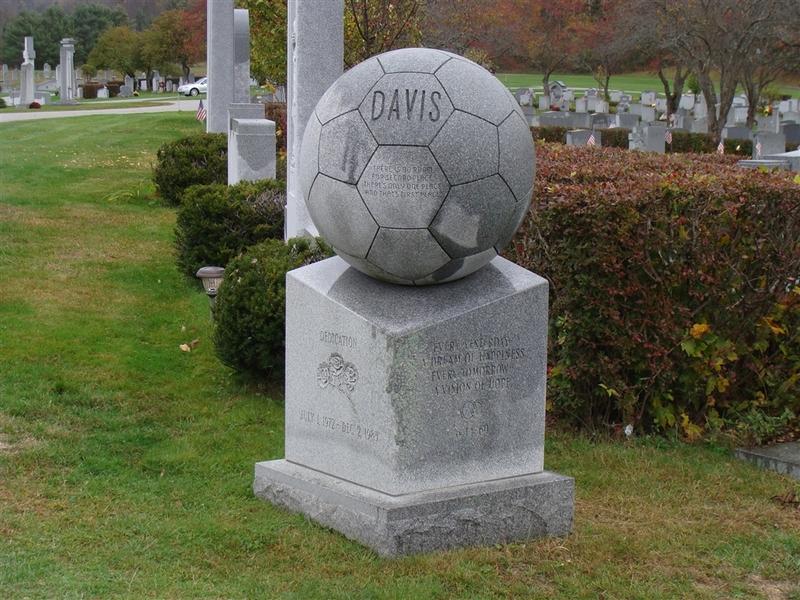 One of the main uses of granite throughout the country was in tombstones and memorials. Silicosis, a respiratory disease caused by granite dust, was common among the artisans and sculptors who were breathing it in every day, which led to an abnormally high death rate. Appreciating this, many sculptors started designing their own tombstones to showcase their skill. And what skills they had. Some of the tombstones are the finest examples of memorial design and granite craftsmanship ever produced. Some of them are also one of the strangest designs you are ever likely to see. A NASCAR racing car? A football? An armchair? A biplane? Those are only few examples, there are many more interesting and beautiful sculptures. I had a good walk around but unfortunately the miserable weather from New Hampshire caught up with me and I had to move on fairly quickly. From Barre I headed just a few miles up the road to Montpelier which is the smallest state capital in the United States. It was obviously named after the French city of Montpelier. Of course it happened in the times of general enthusiasm for things French as a result of the country’s aid during the American Revolution. No chance of that happening nowadays. I started my visit from the Vermont capitol. 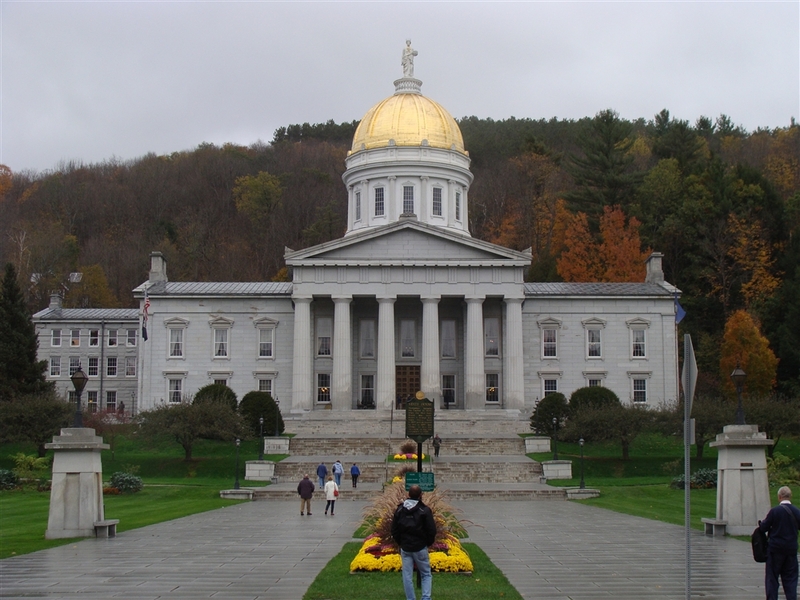 Against its backdrop of wooded hills, the Vermont State House is one of the most picturesque statehouses in the country. Designed in 1857, it is an exquisite example of Greek Revival architecture. Grey granite from Barre was used for its construction but its most striking element is the dome. Made of wood sheathed in copper it is covered with 23.7 carat gold leaf, as pure as can be obtained. A statue of Ceres, the goddess of agriculture, stands atop the dome, symbolizing the importance of that industry to the state. It might not be the most impressive or lavishly decorated capitol I have ever visited but it is definitely worth a stop if you are around. Besides, it was a good place to escape the pouring rain. The town itself is rather sleepy but pleasant and has some great wooden houses as well as quite a few good independent eateries. I had a very tasty BBQ sandwich in one of them. 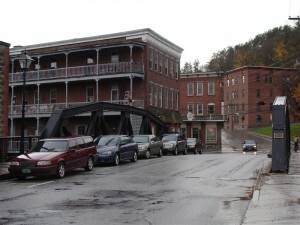 In general Montpelier was lovely but the weather wasn’t really improving so I decided to head west again. I used the network of local state highways and started driving across the beautiful Green Mountains towards Lake Champlain. Of course at the time of my visit (October) the mountains weren’t green at all. They were red, yellow and orange. Absolutely mad colours which made a great sight even on a rainy day. Finally, towards the end of the day, the weather did improve and I even managed to get some glimpses of the setting sun. This little bit of sunshine caused quite an amazing transformation. I quickly understood what all the fuss about the Vermont foliage was about. At that moment the colourful Green Mountains shrouded in mist were behind me, Lake Champlain ahead of me and I was surrounded by the beautiful rural landscape of the Champlain Valley. I have to say it must be one of the most beautiful corners of the world. Rural perfection (if such a thing exists). I stood there for quite a while simply admiring the views. I just stopped besides the road but I felt as if I was at the end of the world or at the gates of paradise. There was no traffic, not a single car in sight for quite long moments. I could have stayed there a lot longer but it was getting dark and chilly so I got into my trusty rental Lincoln and headed towards New York state, just across the bridge over Lake Champlain. I left Vermont almost exactly 24 hours after entering New Hampshire the night before. Wasn’t it short? Of course it was, but this time I was only really passing through as my schedule was rather tight. Besides, I’m sure I will visit New England again. This entry was posted in Uncategorized and tagged Barre, foliage, Green Mountains, Hope Cemetary, Kancamagus Hwy, Lake Champlain, Montpelier, New England, New Hampshire, New Hampshire Route 112, Vermont, Vermont State Capitol on May 12, 2013 by admin.